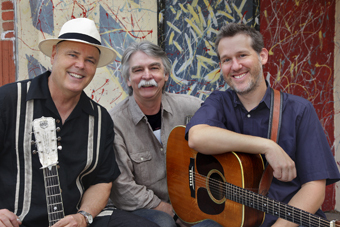 Grammy-winning musicians Bryan Sutton, David Holt, and T. Michael Coleman celebrate the musical genius of the late Doc Watson in a show that mixes traditional classics with fresh originals. “Doc has been a primary influence on all three of us,” David says, “and we want to follow his lead in performing a wide range of traditionally-based songs and tunes that really reach out and grab a crowd.” With extraordinary musicianship, great singing, and a repertoire of wonderful songs, the trio explores and extends Doc’s rich musical legacy. Bryan is a five-time winner of the International Bluegrass Music Association’s Guitarist of the Year Award and a Grammy winner with Ricky Skaggs in 1998 and with Doc in 2007. As a Nashville session musician, he’s played on dozens of albums by artists like Dolly Parton, Bela Fleck, the Chieftains, and the Dixie Chicks, and he’s also recorded four fine albums of his own. David, winner of four Grammy awards, accompanied Doc on tour from 1998 till Doc’s death last year. In 2002 their album Legacy won the Grammy for Best Folk Recording. Besides being a stellar musician, David also hosts Riverwalk on public radio and Great Scenic Railway Journeys on PBS. He has spent the last several decades collecting and performing traditional music from southern mountaineers including Roy Acuff and 122-year-old Susie Brunson. ArtistWorks is the world's leading provider of online music schools and it's Video Exchange™ Feedback Platform enables anyone to learn directly from the world's foremost experts all from the comfort of their own home. ArtistWorks' subscribers in over 58 countries have access to a library of over 35,000 online music instruction videos and receive personalized video feedback from award-winning musicians, including bassist Nathan East (Eric Clapton, Phil Collins), percussionist Luis Conte (Madonna, Santana), banjo player Tony Trischka (Paul McCartney, Bela Fleck), guitarist Bryan Sutton (Dixie Chicks, Taylor Swift) and flutist Jeffrey Khaner (Juilliard professor) among others.